I’m now back at home after our Christmas and New Year festivities, which included a family wedding. I am now so far behind with blogging that I’m not going to attempt to catch up with writing about all the books I’ve read. But I’ve got several posts in draft form summing up my reading over the year and this is the first one. 2015 was a good year for books and I read 103 books in total, most of them fiction, but I did read more non-fiction (19) than in previous years, even though I didn’t manage to write about all of them. On the fiftieth anniversary of Churchill’s death, Boris Johnson celebrates the singular brilliance of one of the most important leaders of the twentieth century. Taking on the myths and misconceptions along with the outsized reality, he portrays’”with characteristic wit and passion’”a man of contagious bravery, breathtaking eloquence, matchless strategizing, and deep humanity. Fearless on the battlefield, Churchill had to be ordered by the king to stay out of action on D-Day; he pioneered aerial bombing and few could match his experience in organizing violence on a colossal scale, yet he hated war and scorned politicians who had not experienced its horrors. He was the most famous journalist of his time and perhaps the greatest orator of all time, despite a lisp and chronic depression he kept at bay by painting. His maneuvering positioned America for entry into World War II, even as it ushered in England’s post-war decline. His openmindedness made him a trailblazer in health care, education, and social welfare, though he remained incorrigibly politically incorrect. Most of all, he was a rebuttal to the idea that history is the story of vast and impersonal forces; he is proof that one person’”intrepid, ingenious, determined’”can make all the difference. 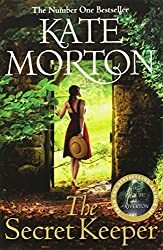 The Secret Keeper by Kate Morton. I loved everything about it ‘“ the descriptive passages, the mystery, the secrets and the people involved. Happy New Year and I’m looking forward to reading more excellent books in 2016! Happy New Year, Margaret! I liked your favourite books of 2015. I hope to read Martin’s “The Golden Age of Murder” this year. I’m glad to see an earlier Mantel in your list. I was a great fan of hers long before ‘Wolf Hall’ and I think more readers should be exploring her back list. Happy New Year from Me and The Bears. I’ve got several of your favorites on my list for 2016. I definitely want to read The Secret Keeper this year. Hope your holiday time was fun and Happy New Year, Margaret!! Happy New Year! That’s a great list of favourites. I’ve read a few of Kate Morton’s other books and enjoyed them, so I must try reading The Secret Keeper at some point! A jolly good reading year you’ve had, Margaret! I like the fact that your reading is always so varied. Happy New Year. Look forward to your reviews in 2016. Happy New Year or reading! I loved Kate Mortons books when they first came out but I have since neglected her. I will rectify that this year. I’m glad you had such a good year of reading, Margaret. And you’ve got such a wonderful variety of books here! So glad you enjoyed the Cleeves, the Edwards, and the Rankin in particular. And I must read the Morton – thanks for the reminder. Great variety here, Margaret – glad you enjoyed your reading year! I’m also glad you enjoyed the Churchill book – I loved it. Boris Johnson is such a great writer – I kinda wish he’d stick to that! 😉 Looking forward to seeing what books you recommend in 2016 – Happy New Year! Thank you and a Happy New Year to you too. You look like you had a great reading year in 2016; so many books on your favourites list I would like to read too. I wish you more excellent reading in 2016.